This weapon ran 10’s not too long ago, when it was just running an LS1 V8. Now combined with a Magnuson Supercharger and a Toyota Automatic Trans-Axle gearbox, this thing runs 9’s (checkout the vid below)! Back in the mid-Eighties the 255hp V8 powered Lamborghini Jalpa offered open top driving at about half the price of the then current flagship, the Countach LP500S, so the smaller Jalpa offered all the joys of owning a real Lamborghini for a relatively reasonable amount of money, today this would come down to a Gallardo versus an Aventador in fact … similar comparison. However buying a Lamborghini is only part of the fun, keeping it on the road could soon prove to be a very expensive experience … and to make things worse over the last 25 years maintaining a Jalpa didn’t get any easier with parts being very hard to find and the few people that still know how to work on these classic Lamborghini engines aren’t charging peanuts either. 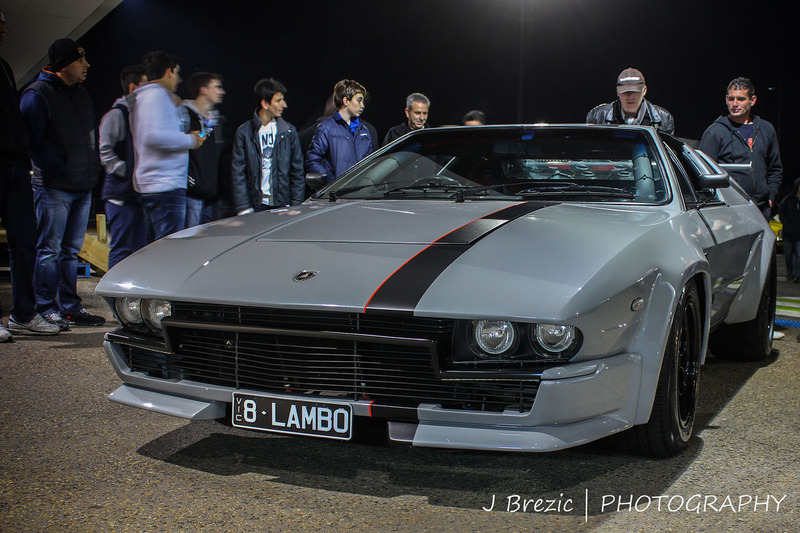 When Nik from Australia bought himself a genuine Lamborghini Jalpa P350 a few years ago he was impressed with the driving experience and the handling, both could keep up with much more modern cars, however performance from the 255hp V8 just didn’t age that well … so he made a very bold move. After some sleepless nights wondering how much power he could derive from the original V8 before it could blow up Nik decided to remove the original 3.5 Liter V8 Lamborghini engine and install a much more common GM 5.7 Liter (346ci) LS1 engine in the vacant position … instantly boosting power from 255hp up to around 500hp while lowering overall weight as this new LS1 engine wasn’t as heavy as the older Lamborghini V8 (which already wasn’t too heavy to begin with) … an added bonus of this ‘transplant’ was the fact Nik’s Jalpa now was a lot closer to a 50/50 weight distribution too. Still you just don’t take a Lamborghini V8 from a Jalpa and drop in an LS1 engine without some serious modifications, hence it took Nik a long time to get it all sorted out … but he managed to create a one of a kind Lamborghini Jalpa in the end, and that is what matters. In fact the EFI on the newly installed LS1 engine didn’t suffer from the heat as much as the Lamborghini V8, and the GM unit made the Jalpa stand almost one inch taller being about 150kg lighter … and keep in mind parts for this Chevrolet 5.7 Liter V8 are available at every car shop in Australia … well almost I guess. The original gearbox surely couldn’t keep up with the extra power so Nik decided to install parts from an MR2 Turbo … transaxle, shifter, linkages, clutch, slave cylinder … the works so to say, Nik even used modified MR2 axles on the original Jalpa hubs. One of the hardest things to get right proved to be the adapter plate which had to be custom machined just for this Jalpa, just like the original GM flywheel that needed to be machined down to suit the MR2 clutch setup while the shifter cables were custom made at $400 because the MR2 is a shorter car compared to the Jalpa. The engine cradle itself remained almost the same, naturally it has been strengthened around the engine mounts and gussets to keep it from flexing … while the weight of the engine and transmission might be lower than the original V8 the additional torque output can easily damage the entire frame. When Nik started up the new engine in the Jalpa and was able to take it onto the road for an initial test he was really impressed … tires could be sent smoking in every gear with acceleration never seen in this ‘Baby Bull’ before, Nik even managed to get most of the original dials on the dashboard working with the new engine, the rpm gauge played it hard but eventually gave in too. This 1988 Lamborghini Jalpa P350 was finished in dark blue over a tan leather interior with blue piping when Nik bought it, and at first he was going to keep it like that, Nik even went out and bought those beautiful Silhouette style wheels from EuroSpares, 8×15 inch up front and 11×15 inch at the back with 205mm and 335 tires respectively but Nik decided to completely restore the car after frying a second clutch during a drag race … Nik has a passion for drag racing too by the way. So when the entire drivetrain had to come out of the car to replace the clutch … again, Nik also modified the transaxle to shift without the clutch on the track while still being able to shift using the clutch on the street … don’t ask me how but he managed to do it … before Nik decided an automatic transmission from a Toyota Camry would be an even better idea. Stripping the car completely unveiled a lot of bad repairs and rust, as the car came from England Nik even found rust under the rubbers, removing the tar and stone guard/underbody detainer actually took 10kg from the overall weight! Nik also decided to modify the looks a bit, the pop up headlights were removed and their holes welded up, the front bumper showed some damage so it got a one way ticket to the bin as did the rear bumper in fact. 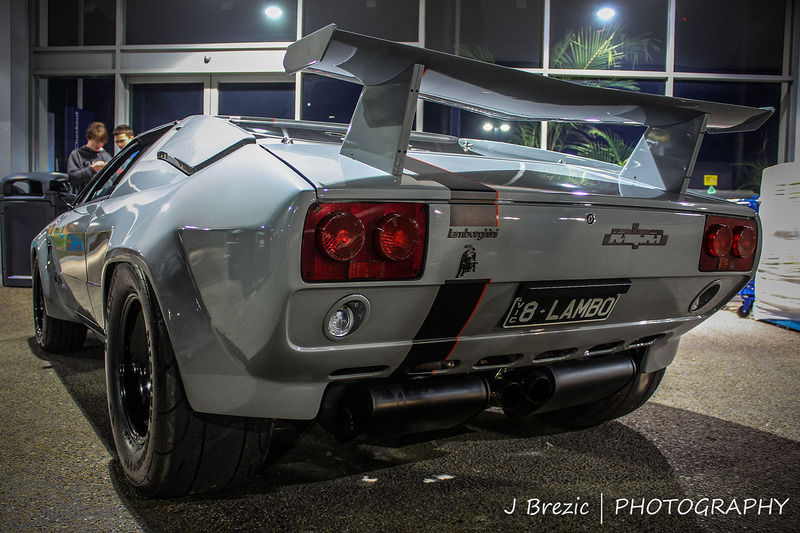 Reverse lights were built into the body after being sourced from a 1966 Ford Mustang and that custom made exhaust showing two massive tips at the middle of the car made this unique Jalpa picture perfect. The all aluminum rear wing remained and for safety reasons Nik installed a complete roll over cage inside the cockpit, note he made this cage in such a way the side intrusion bars are removable to make it easier to get into and out of the car during normal street driving but still being completely legal for drag racing. The exterior rear view mirrors were replaced with small, lightweight race style units and the doors now open at the push of a button … like magic. The original tan leather interior has been replaced by a nice black shade with gray stitching, color coded to the exterior paint to fit into the overall look of this amazing car. While the Jalpa was spread all over the place in parts Nik decided to replace the front wheel bearings … which could turn into an extremely expensive experience trying to get original parts, however as it turned out he found a Mazda part that just about fits straight onto the Jalpa … and costs only a third of the Lamborghini part. Power to accelerate is one thing … stopping afterward might be a totally different story as Nik didn’t feel the original Jalpa brakes were up to the task of getting 500hp to a full stop in all safety. The brake lines were already braided so these didn’t flex like rubber lines would, but still Nik replaced the Bendatalia brake booster/master from the Jalpa with a unit taken from the MR2 he already bought for the transaxle transplant … there was some welding required to fit the MR2 booster onto the Jalpa pedal box. Replacing the original brake pads with EBC Yellow Stuff ones up front and EBC Red Stuff ones at the back really improved stopping performance on this Lamborghini. Now finished in a nice gray shade this Lamborghini Jalpa LS1 really impresses, starting out with a 500hp output from the 5.7 Liter V8 engine paired with an LS6 manifold, smaller cams, some head work and a few other modifications Nik managed to put down a nice 11.8 seconds at the quarter mile drag reaching 119 mph along the way … but that wasn’t the end of the story. After some additional modifications and replacing the MR2 gearbox with an automatic gearbox from a Toyota Camry Nik managed to put down a healthy 10.65 seconds reaching 130 mph on the quarter mile at the Calder Park Raceway in Victoria, Australia in mid 2012, this time with massive Mickey Thomson Drag Radials on different wheels at the rear. Today Nik’s Jalpa shows another very impressive modification … apparently the 500hp power output from the LS1 didn’t keep Nik happy for too long so he installed a stunning looking Magnuson MP112 Supercharger kit onto the engine. This kit comes as a bolt-on for this type of engine and can be installed in about 12 hours, comes with a 3-year/36,000 Miles warranty and when set at a boost of 6psi this Hybrid Roots Style Supercharger increases power by about 120hp while torque gets an extra 120 Lbs.ft., add the MSD Atomic LS EFI supporting up to 1000hp with integrated fuel lines and ECU and we could be talking about a Jalpa P600 here … 600hp in a car from the Eighties, 1988 to be exact as this specific Jalpa is production number 387 of only 412 ever made.